Located in the Bulandshahr district of the north Indian state, Kuchesar is a small village. During the British era, it was the seat of Zamindari that is a princely state. It is around 80 kms away from the capital of the city, Delhi. After the Mughal dynasty, while competing with other rulers like the Marathas, Rajputs, Sikhs, Rohillas and other foreign invaders, the Jats of Dalal clan ruled the place for a long span of time. The first fort was erected here way back in the 18th century and later several others were erected during different times. Some of these residences of the royal family are now converted into Heritage Hotels in Kuchesar. 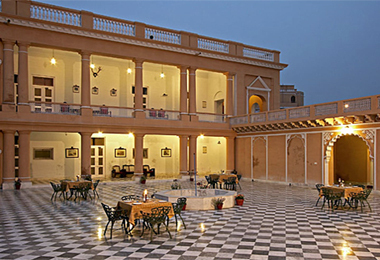 Through Heritage Hotels of India, you can book your room at this amazing property with an awesome royal and luxurious feel to each and everything related to it. The present time caretakers offer excellent services and amenities to their guests along with warm hospitality of the Indian staff. You have a comfortable stay in spacious air-conditioned rooms that are well-appointed and have plush furnishings. Relish sumptuous delicacies of Indian, local and other world cuisines prepared by the in-house chef.